Thursday’s European Central Bank (ECB) announcement on monetary policy should attract considerable investor attention, given mounting deflation concern and faltering growth across much of Europe. The flow of data relating to economic and market fundamentals has become increasingly mixed as global inflation slips, demand from emerging markets weakens further, and investors express higher risk aversion. The widening of credit spreads, flattening of the yield curve, and an increase in volatility, as measured by the VIX, are all clear manifestations of heightened risk aversion. These impulses, coupled with continued signs of weakness in global growth, have led to declines in our outlook. Our latest forecast has the barometer tracking towards 45 in the weeks ahead. Recent developments in oil markets have added to near-term uncertainty, although the drop in oil prices is far more likely to convey more benefits than penalties to long-term growth. In the past, the global economy generally responded favorably to falling oil prices. Drops in oil prices took place in both the late 1980s and 1990s. In each case, increased purchasing power that resulted from lower energy costs helped to boost growth and extend expansion. Today’s oil price declines and a rising foreign exchange value of the dollar represent a significant benefit to household purchasing power, but may also shift some income away from business profits. Similarly, depressed oil prices shift benefits away from net oil exporting countries to net oil importers, resulting in vastly different impacts across countries and regions. The uneven impacts complicate policy responses across the globe and make forecasting outcomes more difficult. Energy prices are also having a material impact on inflation. Global inflation will likely reach record-low levels in the months ahead, and this is generating concerns among investors and central banks. To the extent that markets interpret overall price declines as increasing the chances of a slide into global deflation, these concerns may further damage investor enthusiasm for risky assets raising risk premia and depressing asset prices. On the other hand, the threat of outright deflation provides coverage for central banks to engage in more aggressive monetary policy – a potential catalyst for further asset price gains. With this as a backdrop, financial market participants will turn their attention this Thursday to the European Central Bank, which is expected to unveil a program of sovereign quantitative easing. Markets expect the ECB to announce at least a €500 billion sovereign debt purchase plan to be executed over the next 12 to 18 months. It is also possible that purchases of non-financial corporate debt, in addition to the €500 billion of sovereign debt, could be authorized. Lastly, enhancements might be made to the existing TLTRO (Targeted Longer-Term Refinancing Operations) program. Given the recent sharp decline in inflation, and the importance of the ECB’s goal to achieve price stability, it is conceivable that Thursday’s announcement could be even bigger than what markets already envision. The steady and significant decline in the euro dollar exchange rate to 1.15, and the recent announcement by the Swiss national bank to remove their peg to the Euro, suggest that a rather large program may be in the offing. On the other hand, if the ECB fails to impress markets, investor concern over deflation would certainly grow. Hence this week’s announcement will be especially important. While we must recognize the risks in the current environment, we remain hopeful that the positive dynamics in the global growth story can regain momentum as the oil price decline becomes more fully incorporated into the outlook. We are reminded that the global economy is expanding near 3% in recent quarters led by steady growth here in the United States. 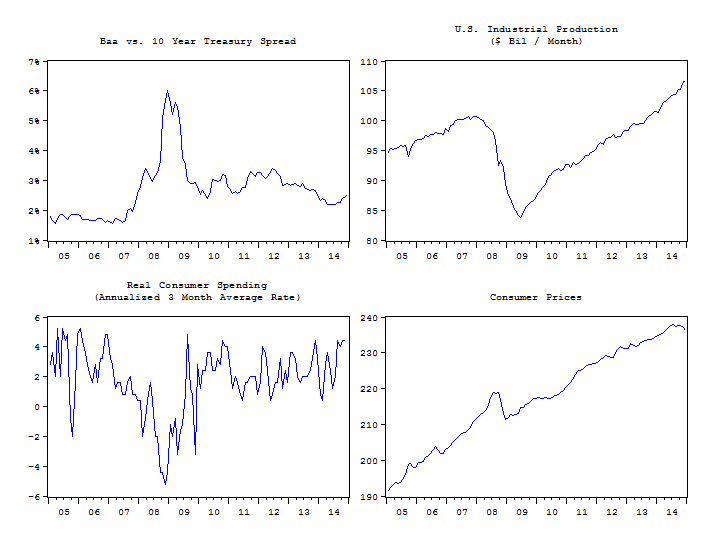 While investor anxiety has picked up, U.S. industrial production remains near record highs, and real consumer spending is growing near 4% – close to the fastest pace of the recovery (see charts below). Falling oil prices are contributing to overall weakness in the headline readings for consumer prices. Recently, we lowered our equity exposure to neutral from overweight in response to slippage in incoming fundamental and market-based indicators. We continue to evaluate data as it comes in, and will not hesitate to make further tactical adjustments to portfolios as warranted.